Ensighten is the leader in omni-channel data and tag management. Ensighten help global brands change the way they collect, own and act on their customer data across all digital touch points. Using their services, clients can expect to deliver one-to-one personalization making for a more enjoyable user experience, optimizing marketing initiatives to their full potential. Ensighten aim to deliver personalized experiences across all channels and devices based on data from on-site, off-site, display, CRM, email, pixel and even offline data. As a result, clients can provide users with contextual personalization all the way through their customer journey. We’re excited to be included in the tag container of Ensighten. This makes it even easier for eCommerce brands to switch on our tag and start collecting visitor data quicker than ever before. 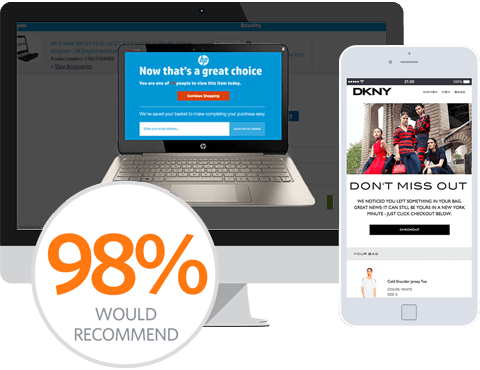 Being deployed through Ensighten means SaleCycle are able to make their remarketing campaigns even more robust. By supporting the data that Ensighten collects around the customer journey, SaleCycle can provide even more well-rounded personalized campaigns, fine-tuned to help clients reach their goals quicker.